I know, I know. I posted a recipe with crab and corn just last week. If there were some food blogging rule book in existence, I’m sure I broke a major rule by posting two crab and corn recipes in a row. Good thing no such book exists. Though I often have meals planned out several weeks in advance, I don’t always follow my own schedule. Sometimes, I cook based on emotion and yesterday felt like a crab and corn chowder day. It started with a trip to the grocery store. They were having a great sale on lump crab meat and I just could not resist. Fresh corn was also a steal. So, I threw them both in my cart thinking that experimenting with crab and corn chowder recipes would be a great weekend project. As I was checking out, huge storm clouds blew in and it poured down rain. It continued to rain for the rest of the day. Then to top things off, my younger daughter had her braces tightened at the orthodontist’s office. Her teeth were so sore she begged me to make something soft for dinner. Given how pathetic she looked, it would have been plain mean to serve the roasted pork loin I had originally planned for dinner. All the signs pointed to making soup yesterday and that’s how we ended up with crab and corn chowder for dinner. There were no complaints though – only the sounds of happy slurping. After all, what could be more perfect than a warm of bowl of chowder dotted with tender crab and sweet corn on a gray and rainy day. Add the bacon to a large saucepan or Dutch oven over medium heat. Fry bacon until nicely browned, then transfer to a paper towel-lined plate; set aside. Drain off all but 2 tablespoons of bacon grease from pan. If you do not have enough bacon grease or prefer a lighter dish, substitute in olive oil. To the same pan, add the onions and sauté until the onions are tender and lightly browned, about 5-6 minutes. Sprinkle flour over the onions and cook for 2 minutes stirring constantly. Stir in chicken broth and celery salt, scraping up any browned bits from the pan. 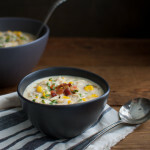 Stir in corn and bring to a boil; reduce heat, and simmer, stirring occasionally, until soup has thickened slightly and corn is firm-tender, 20-30 minutes. Gently stir in crabmeat, cream, cilantro, pepper, and salt. Cook 4 to 5 minutes or until chowder is heated through. Serve warm with crumbled bacon and a sprinkle of chopped cilantro, if desired. For a slightly lighter and less rich soup, you can use the lesser amount of cream.